L to R: District Superintendent Rev. Peter Isaac, Rachel Jereva, Rev. Keithly Jereva, Rev. Meriam Naunga, David Naunga, Pastor Aline Gideon, and Rev. Gideon Sam. 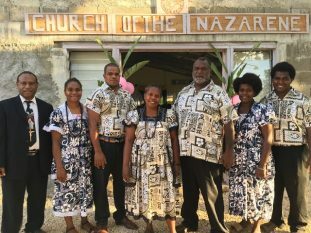 A great milestone was hit at the recent District Assembly in Vanuatu. Not only was the District Assembly held in a newly constructed District Center, but the District gave its first ordination service ever on October 30 ordaining three new ministers: Rev. Keithly Jereva, Rev. Meriam Naunga, and Rev. Gideon Sam. Micronesia/South Pacific Field Strategy Coordinator Harmon and Cindy Schmelzenbach along with Regional Director Mark Louw and his family witnessed this historic event while General Superintendent Filimao Chambo presided.